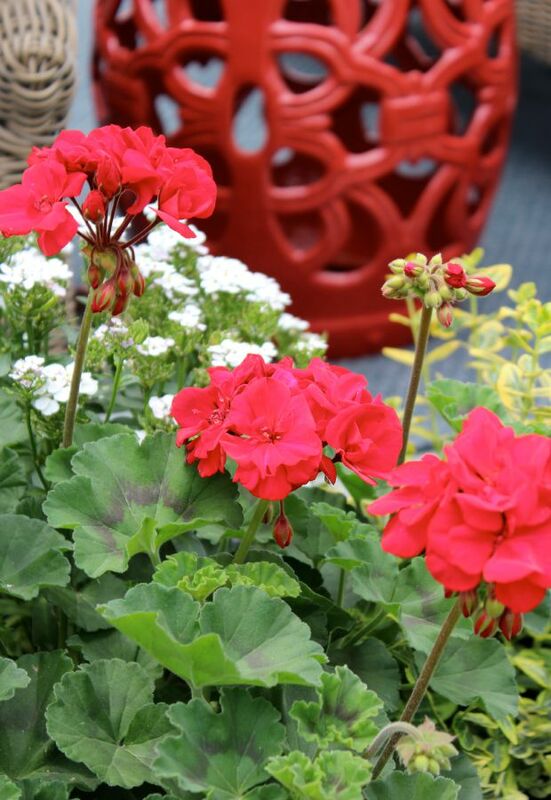 Add pretty geraniums to your outdoor space for a pop of vibrant red color and texture all season long with little maintenance! Happy Friday! Do you have big plans for the weekend? I’m heading out to a friend’s to do some Saskatoon picking this afternoon. That likely means some baking on Sunday. Tarts? Cheesecake? Pavlova? What would be your pick? After adding a red garden stool to our outdoor lounge area last spring, as well as spray painting an old bench red, I was convinced color was the way to go. On even the most drab of summer days, our yard still looked alive. This May, I was inspired by my lovely neighbour, Fiona, who made it to the garden centre well before I ever did. She hung gorgeous bright colored baskets all around her deck. And the red ones caught my eye every time I looked out the back window. So, red it was! 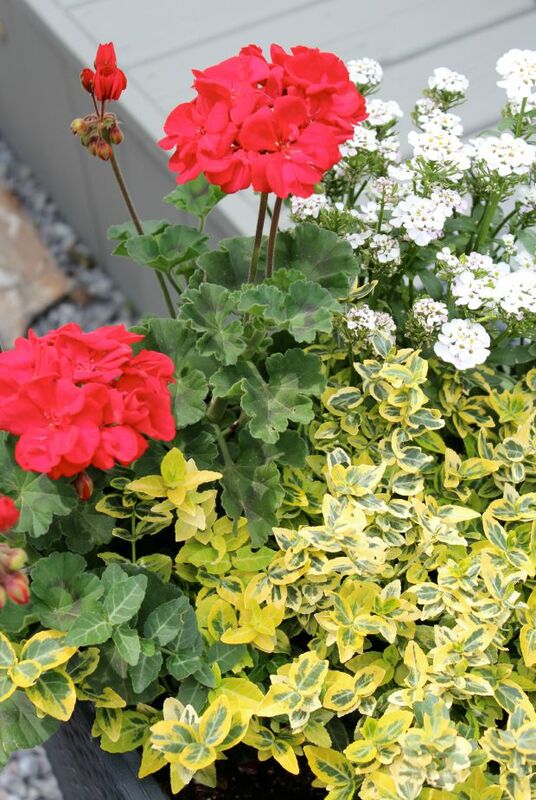 To add a bit of texture to each planter, I paired the red geraniums with a euonymous shrub in yellow and green. For the white, I chose iberus, otherwise know as candytuft. It’s a perennial that I may plant in a garden bed this fall. 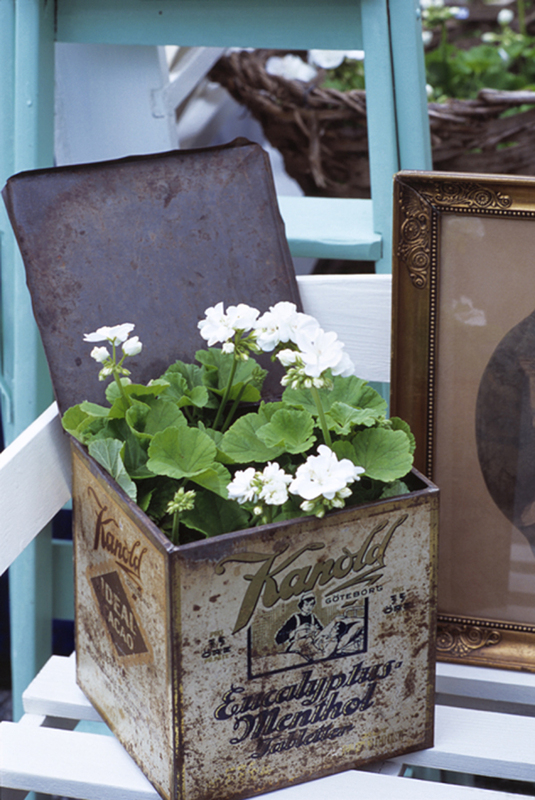 Geraniums are a bit nostalgic for me. I remember my mom planting them in wooden containers that sat on our porch with white-painted spindles. Oh how I wish I had some of those spindles for a DIY project, but they were given away years ago when they transformed the whole thing into a sunroom- darn! Perhaps it’s too late in the season to think about planting containers, but I always enjoy gathering inspiring gardening ideas on Pinterest. Here are a few that will likely make their way into my yard someday. Did you play it safe with your flowers this year or mix it up? 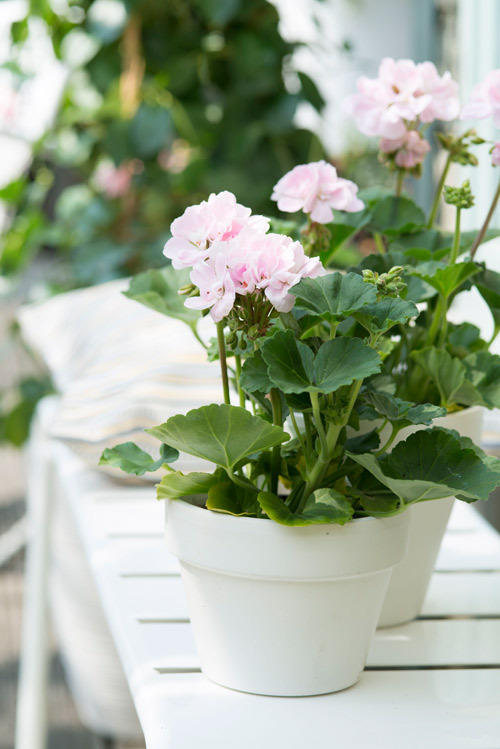 Ever planted geraniums? I like to play with colour combinations too and it’s fun to change things up! 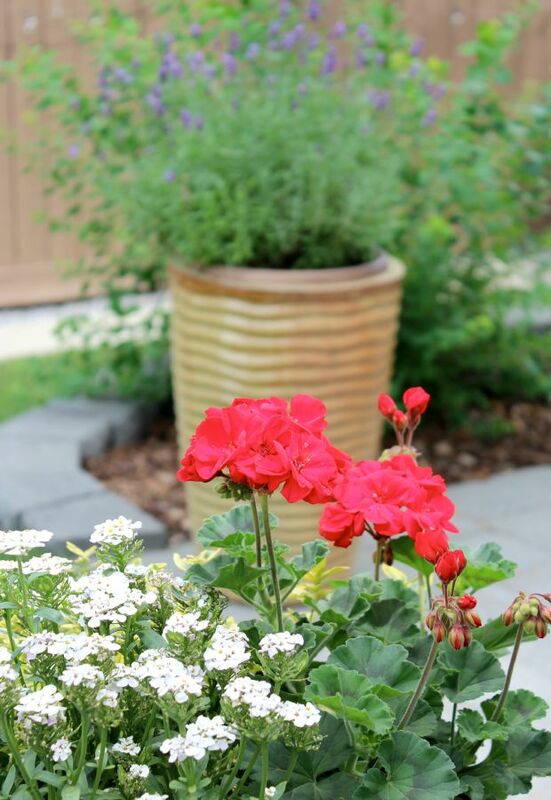 You can’t go wrong with red geraniums I think, they are a classic favorite. 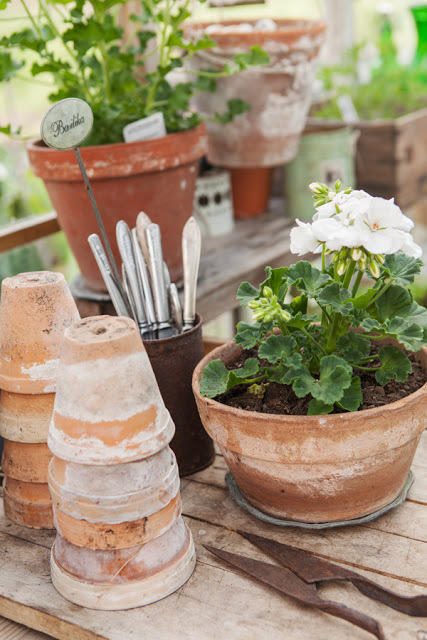 I’m heading over to peek at your garden board on pinterest right now, thanks Shauna! 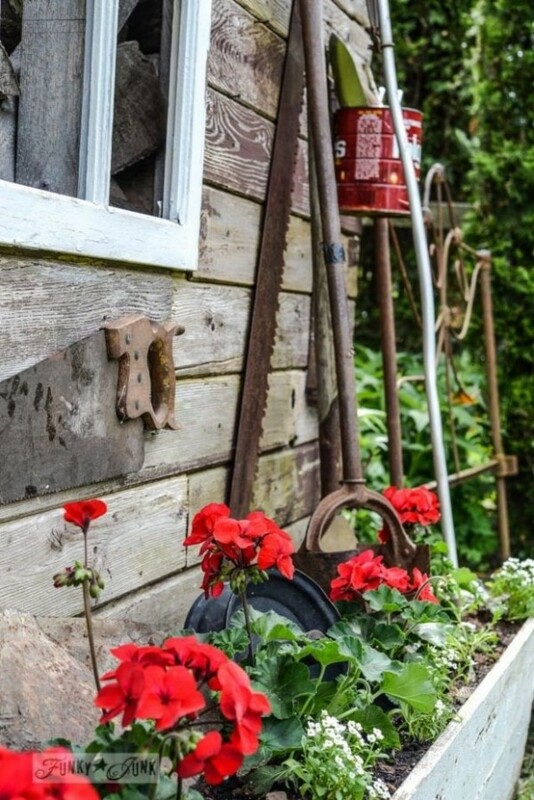 I love geraniums, and red is my first pick! This year I didn’t do anything because of the move, but now that we’re here I am itching to get started. I know it’s late in the season, so I’m not sure how far to go or even what to do, but yesterday I set out my empty planters just to begin envisioning the possibilities. Your photos are beautiful and I love the inspiration ones you shared too!! I love all white too.. maybe next year I will be brave and add some colour, the red is really beautiful and adds that drama and depth. Hmmm… I wish I could fly you out to help me plan my garden, something I seem to really struggle with. Red is a favorite color of mine and agreed will make it look alive! I will pair the three in containers this summer and hope to plant next year. Right now, I just want to make it look pretty while I work on plans for things with more longevity, things that will return. I will def pin your post and subscribe so I can follow you as I create my backyard sanctuary!